Tripp Lite's B126-004 splits a HDMI signal into 5 (1 Local, 4 Remote), and allows you to locate monitors over long distances using a single Cat5e/6 cable. Connect up to 13 monitors (1 Local, 12 Remote) by daisychaining up to three units together. When used with an active remote unit (B126-1A0 or B126-1A0-WP), a 1080i (60Hz) signal can be extended up to 200 ft.; or, a 1080p (60Hz) signal can be extended up to 150 ft.. When used with a passive remote unit (B126-1P0 or B126-1P0-WP), a 1080i (60Hz) signal can be extended up to 100 ft.; or, a 1080p (60Hz) signal can be extended up to 50 ft.. 24Awg, Solid wire Cat5e/6 cable (Tripp Lite N202-Series) is required to reach max distance and resolution. Supports both stereo audio and 7.1 channel surround sound audio, as well as HDCP protected content. 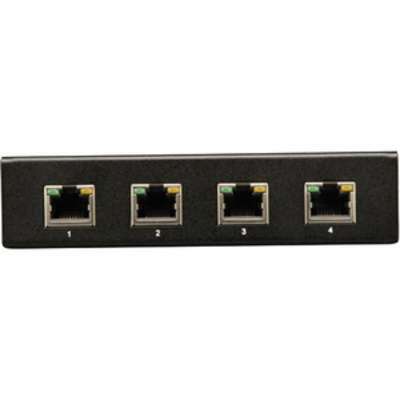 Mounting hardware is included that allows the B126-004 to be rackmounted, wallmounted or pole mounted. Also, up to three units can be mounted in 1U of rack space using a Tripp Lite B132-004-RB Extender/Splitter 19in rackmount bracket. Compliant with the Federal Trade Agreements Act (TAA) for GSA Schedule purchases. 1 year limited warranty. The B126-004 4-Port HDMI over Cat5/Cat6 Extender/Splitter works with Tripp Lite B126-Series remote receivers to split a single HDMI audio/video signal into five separate signals-one local and four remote. It's ideal for digital signs, trade shows, presentations, retail settings and other applications where the video source is located farther than conventional cables allow or that require multiple displays connected to one source. 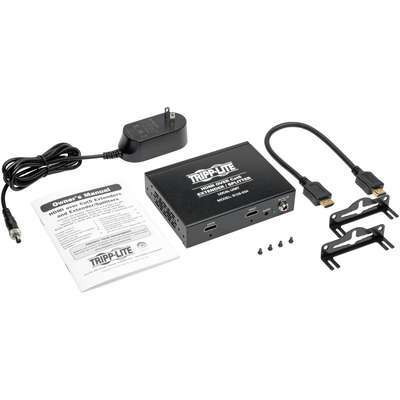 It uses HDMI cable (see Tripp Lite's P568-Series) to connect to the source and the local monitor and Cat5e/6 cable to transmit to the remote monitors (for best results, use 24 AWG solid-wire Cat5e/6 cable, such as Tripp Lite's N202-Series).When used with Tripp Lite's B126-1A0 or B126-1A0-WP-1 active remote receivers, the Extender/Splitter can extend a 1080i (60 Hz) signal up to 200 ft., a 1080p signal (60 Hz) up to 150 ft. and a 3D signal up to 125 ft. With a B126-1P0 or B126-1P0-WP-1 passive remote receiver, it can extend a 1080i (60 Hz) signal up to 100 ft. and a 1080p (60 Hz) signal up to 50 ft. By daisy-chaining up to three Extender/Splitters, one video source can transmit to as many as 13 monitors-one local and 12 remote. Add up to three B126-110 remote repeaters to each channel to fully extend the signal range or add more displays.In addition to crystal-clear video, the B126-004 delivers full, rich stereo and 7.1-channel surround sound (multi-channel or PCM) audio. Easy to set up with no software or drivers to install. Mounts to a wall, rack or pole using the included hardware. Included HDMI cable with latching connectors provides a more secure connection.